Metal Etemon: "None of your business. That aside, Nanomon-chan. Just accept it. So you don't get hurt ♪"
February 26th, 2016. The Digimon World -next 0rder- title site updated with Titamon's character profile today, as well as four new screenshots featuring a mix of storyline and battle sequences. The screenshots show Metal Etemon and Nanomon speaking in front of a "Lemon Power Plant" (レモン発電所 Remon Hatsudensho), with Etemon seemingly bullying Nanomon for it. They also show Omega Shoutmon and Arresterdramon in gameplay, who were previously leaked in this month's issue of V Jump. 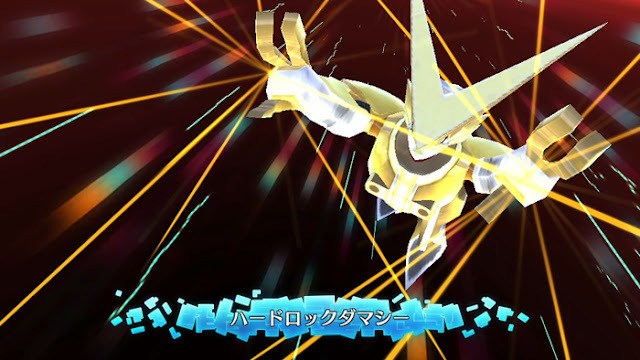 Omega Shoutmon can use the Mach Jab tech, as well as the Finish move Hard Rock Damashii, while Arresterdramon has access to Buster Dive. Titamon's profile is translated below. "Know us as...those who slay gods!" Before the protagonists stands a single formidable enemy. 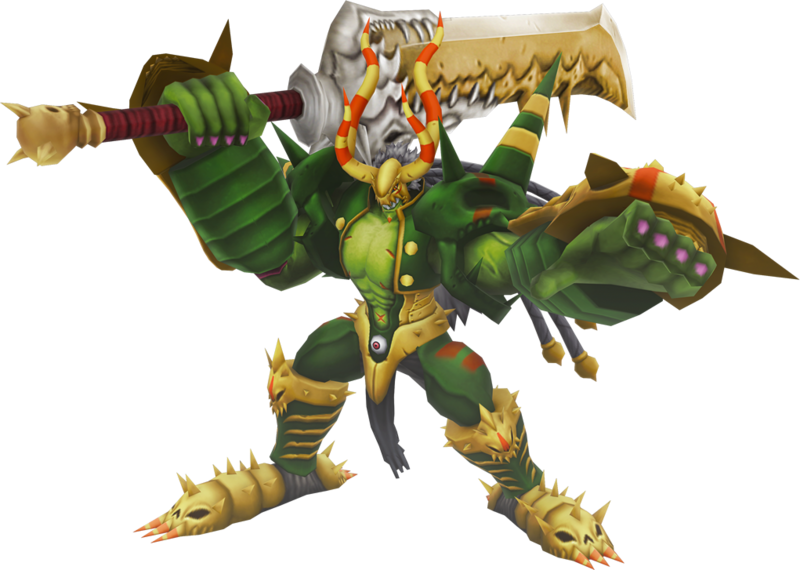 An avatar of destruction born from the gathered grudges of countless roaming Digimon of a particular region, his conduct itself is thoughtless destruction, acting under Shouma's direction. The profile is a counterpart to Metal Etemon's, made public last week. 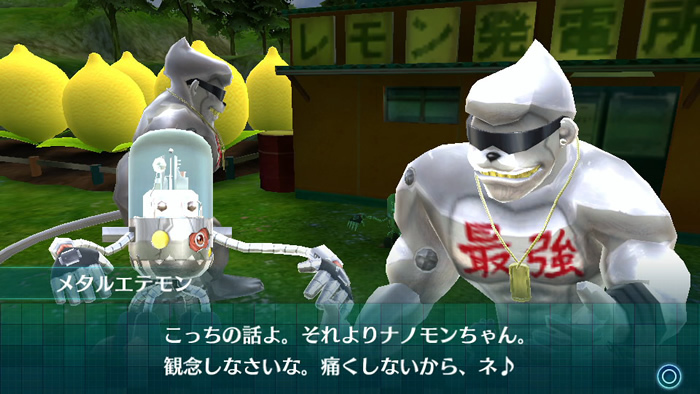 Titamon was featured alongside Metal Etemon in both V Jump and in the game's Jump Festa trailer. Bandai has maintained a constant countdown to the game's Japanese launch on Twitter this past month, uploading photos every day stating how many days remain. 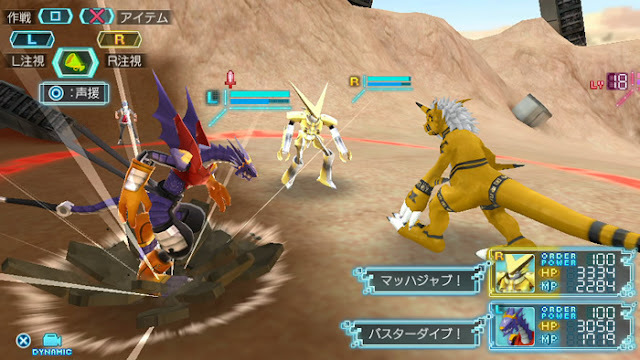 Digimon World -next 0rder- will launch in Japan March 17th, 2016, on the PlayStation Vita for 6,980 yen (7,539 JPY after tax). It is the latest entry in the World series, succeeding directly from Re:Digitize Decode on the 3DS, Re:Digitize on the PSP, and World on the PSX. Tying into Digimon Adventure tri., the game will feature Maicoomon as free downloadable content. For some reason Cyber Sleuth looks better. cyber sleuth does look better honestly the concept, the digimon texture really nice but this game for me the lighting and the way they make texture may turn off new people to try this game thats what im afraid aside with rising the digimon....either way i will buy it if localized it just they serious need get it together with their concept to apeal more newer people..
i notice the texture on some environment but should be cover up with good lighting but this game the lighting make the game over all look bad visually...well thats what i see on animation company im working for.. I think we should wait until the game is out to make comparisons ;D In my case, I will buy it for sure (hope someone make good guides for non-Japanese speakers like they did with Cyber Sleuth hahaha). yesterday stream next order you will upload soon? Do you mean this one, don't you? thank you! touya but you busy or something? we feel you missing and not update anymore? hope you will fine and comback soon.